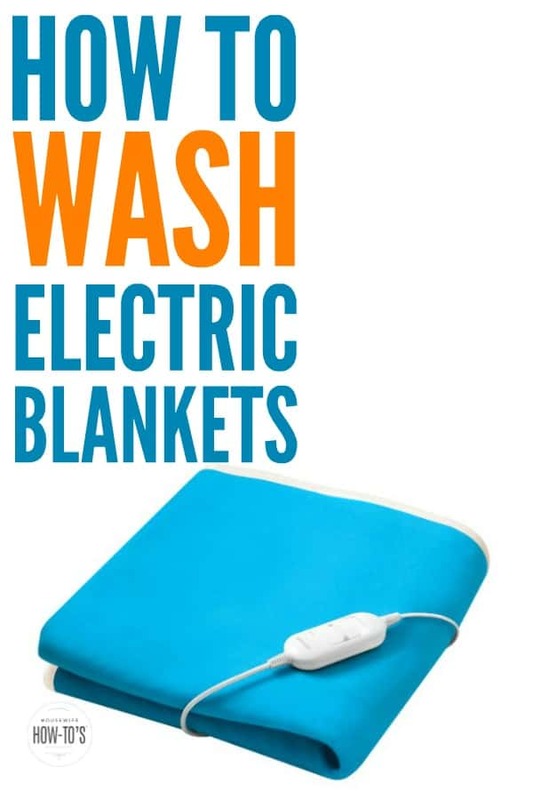 Do you know how to wash electric blankets without ruining them? I didn’t, and I’m ashamed to say that I destroyed three — three! — electric blankets over the years before I finally found out how to wash them properly. One fell apart in the washing machine, while two survived intact only never to work again. Little did I know that you can’t just throw an electric blanket into a washing machine, add detergent, and assume everything will come out all right in the wash, so to speak. 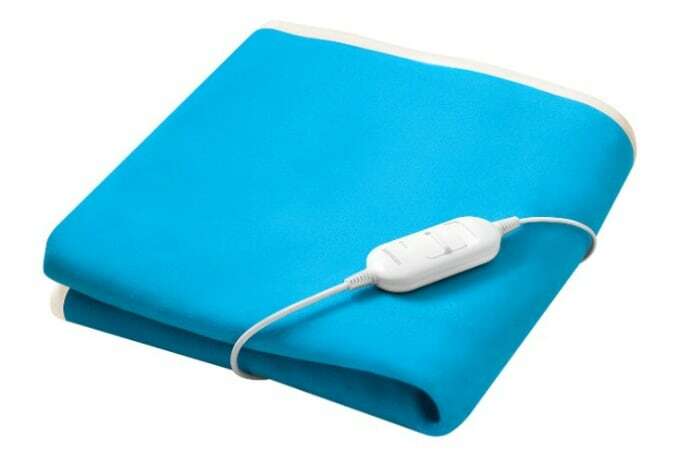 Whether you’re doing some Spring Cleaning, or you’re just tired of that musty smell, knowing how to wash electric blankets without ruining them is a great way to freshen your bed while protecting your investment! Years ago, I thought the only solution was to dry clean them. Wrong! According to the Electric Bedding Care Institute (who knew there was such a thing? ), dry cleaning is more harmful to electric blankets than washing them. The trick, these folks say, is to expose them to water for the shortest possible time and limit their time in the dryer. Armed with that knowledge, and an electric blanket full of dog and cat hair, I followed their advice and was thrilled when my electric blanket came out clean — and it worked! Now I wash mine every two weeks throughout the cold season and again before storing it for the summer. 2. Shake it: If it’s possible, take it outside and shake vigorously to dislodge as much debris as possible. Since we’ll be doing a very short wash cycle, this step helps quite a bit. 3. Top Loading Machines: Fill your washing machine’s tub with cold water and a minimal amount of detergent. Set the washer for the gentle cycle. Immerse your blanket in the tub, let it agitate for 2 to 3 minutes, then skip to the rinse cycle. Allow the machine to complete the rinse and spin, then remove it immediately. 4. Front Loading Machines: Set the washer on the shortest period with a Cold/Cold water setting. Add a minimal amount of detergent and the blanket. Let it agitate for 2 to 3 minutes then skip to the rinse cycle. Allow the machine to complete the rinse and spin, then remove it immediately. 5. Dry it: Place the blanket in your dryer on a LOW setting for no more than 5 minutes. Remove it and stretch the fabric gently with your hands until it returns to the proper size. (You can lay it on a flat sheet, so you know when it’s the right size again.) Once you’ve reshaped it, hang the electric blanket over a laundry line or clothes drying rack overnight. To store an electric blanket for the season, unplug the cords, fold the blanket, and place it all in a plastic storage container. Be sure to stash your blanket in a dry location, preferably off the floor, so it smells fresh next winter when you get it out again. Just a helpful hint….i have a “smart” (or so it wants to believe) HE washer. While the washer does take away some control you can get some control back. Set up a custom wash (minimal water is okay, just run the wash cycle a tad longer). Once ‘washed’ for the desired time (10 minutes or so) – power off the washer. My washer has a ‘rinse’ cycle. Power on the washer and choose to rinse- if your HE washer wont let you, try a spin cycle OR choose another ‘wash’ cycle just dont add detergent. Then either spin or take out and hand wring. Thank you for sharing that, Kimberly! I have been able to use your tips successfully before having to purchase a new washer when mine died. Unfortunately I now have an HE washer which gives you NO control. I personally hate it since half the stuff never gets wet so I have to use the bulky setting every time which is a waste of water. Anyhow, my options are to not wash it or handwash it. It’s a queen size and light colored. It needs more than handwashing. Any ideas. Next washer will be an old fashioned NORMAL one which I can control and doesn’t take an hour to wash with little water. HELP! Thanks so much! Doesn’t your machine let you fast forward to the rinse cycle? I am with you totally I also will go back to plain and simple old fashioned washer. I believe these new washers are so hard on the clothes. I haven’t had mine long enough to want to eat the cost, and chalk it up to a big mistake ,but I’m close to that. Crazy thing will be the one that last forever ,ha ! Ready to give it a try on my blanket . So I’ve been reading all the stuff about how to wash an electric throw,so I am under the impression that you unplug the cord from the wall outlet of course,then you unplug the cord from the blanket.Doesn’t it damage the inner plug and coils if you put them into the washing machine even for 2-3 minutes and run it through a spin cycle? That’s the point, Donna — a very short cycle shouldn’t damage the coils in the blanket. Even most manufacturer’s instructions suggest a very short wash. These steps worked just fine for mine and plenty of other people, but you should make your own decision about whether to try them. Katie how can I wash an electric throw? I live in apartment complex and my washing machine locks and it runs through a 45 min cycle and once it starts it cannot be altered in any way? I think I’d do it in the bathtub by hand, in that case. My blankets inside heating coils appear to be sewn into the blanket, how exactly did you get yours out? You don’t remove the coils from the inside of the blanket. Unplug it from the wall and wash it. Do you have any advice for cleaning the electric blanket using a HE washing machine? Just spray the electric blanket with Lysol disinfectant spray on both sides and toss in the dryer on high for 3-4 minutes. Let the dryer cool and do it again until blankets feels dry. Simple, done. Um, do you wash your sheets and clothing like that? How clean would you feel they were if you did? You might also want to check out the Lysol label: it’s to be used for spot treatment (2″x2″ area) only. That’s because it needs to saturate the area to disinfect it. (The instructions for treating soft surfaces say to spray until the area is wet.) However, since Lysol is highly flammable and its fumes are hazardous to humans and pets — and it says so on the label — it’s not a good idea to saturate the entire blanket then throw it in a hot dryer. I have to agree with you on washing and rinsing the blanket as I would with any bedding. I tried this today after not using my blanket for weeks because I was nervous to wash it. The care instructions it came with didn’t explain enough to make me confident, so thank you! does this really work. Because I have tried other ways and nothing has really worked. help. I am attempting to wash my electric mattress pad. I have a question for YOU. The little plug like attachments that are secured to the pad..the ones you place the cord into..they are OK to wash? THANKS ! I don’t have an electric mattress pad, Kate, so I can’t honestly answer your question. If it were mine, I’d look at what the manufacturer says. If it’s safe to wash the mattress pad, then the plugs secured to it can go in the wash, too. At that point, I’d still use the gentle cycle and wouldn’t spin it for long so they aren’t submerged in water for long. Please let me know how it goes!